I was reading my blogs last night before I went to bed and saw that Angry Chicken had posted a "Dutch Boy" recipe. I've heard of these before...some people call them German pancakes, or oven pancakes. I guess I just assumed they were too much work to bother with. Well, according to this post it's not difficult at all. I had all the ingredients- butter, flour, eggs, milk. And I had a large cast iron skillet. So I threw caution to the wind and decided to give it a try. As it turns out, it really wasn't difficult at all. It was almost too easy. And mine came out just like the picture (which NEVER happens to me). I have only 1 criticism. I really think it is too bland. The recipe does not call for any salt (although I did make the conscious decision to use salted butter). It tasted like a creme puff without the creme. Syrup didn't help much. But at lunch I found this recipe's true calling. I tore the remaining half pancake into 2 halves and filled each with leftover chicken curry....MINDBLOWING. It was like a crepe, only sturdier. This would be amazing with any kind of roasted meat. 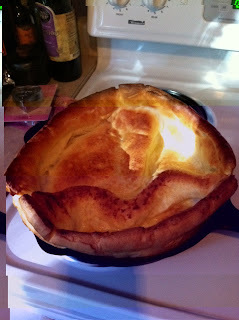 As a matter of fact, after looking at other similar recipes, it is the same as Yorkshire Pudding- which everyone knows goes hand in hand with a big ole slab of roasted beef! This is the kind of thing you eat while standing in front of the ice box at 11pm, stealing cold leftovers. Seriously- I will do this again. Angry Chicken's photo. Mine looks just like it! Yay!